While there has been no reply (yet) from External Affairs Minister Sushma Swaraj, the unusual request has gone viral on Twitter. New Delhi: With close to nine million followers, External Affairs Minister Sushma Swaraj is among the most followed world leaders on Twitter. And yet, she manages to respond to an impressively large number of SOS tweets on the micro-blogging site. Whether it's passport or visa issues or humanitarian concerns, Ms Swaraj's Twitter timeline is typically filled with requests for assistance. Of course, some requests are stranger than others. 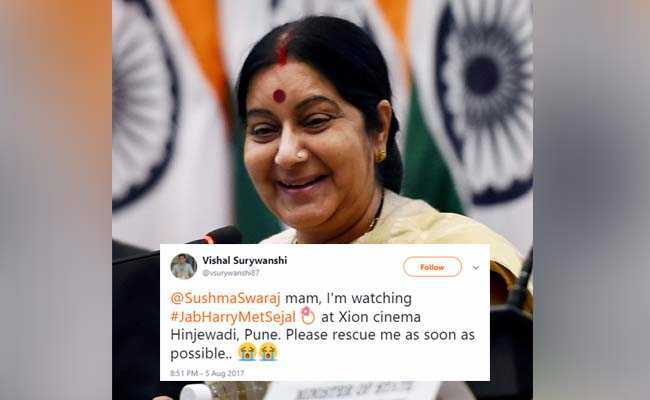 A tweet currently going viral has a man, fed up while watching the Shah Rukh Khan-Anushka Sharma starrer Jab Harry Met Sejal, asking to be rescued from a movie theatre in Pune. "I'm watching #JabHarryMetSejal at Xion cinema Hinjewadi, Pune. Please rescue me as soon as possible.." reads Vishal Surywanshi's tweet from August 5, tagging the minister. @SushmaSwaraj mam, I'm watching #JabHarryMetSejal at Xion cinema Hinjewadi, Pune. Please rescue me as soon as possible.. In three days, Mr Surywanshi's tweet has been retweeted over 1,500 times and 'liked' over 2,400 times. And while there has been no reply (yet) from Ms Swaraj, his tweet has many laughing out loud. This isn't the first time Ms Swaraj has received a rather, umm, unorthodox, request for help. Last year, someone asked the minister for help with his refrigerator and another tweeted about his car. In June, a person cheekily asked to be rescued from Mars. Ms Swaraj's witty reply to him instantly went viral.